Israeli Prime Minister Benjamin Netanyahu came away from a visit to Brazil a few months ago with promises from Brazilian President Jair Bolsonaro to open an embassy to Israel in Jerusalem. On Sunday, that promise was not fulfilled by Bolsonaro during a visit to Israel, but other actions left Netanyahu hopeful. “I welcome your decision to open a trade, technology and innovation office, an official office of the Government of Brazil, in Jerusalem. I hope that this is a first step toward the opening in time of the Brazilian Embassy in Jerusalem,” said Netanyahu to the Brazilian leader, according to an Israeli press release. 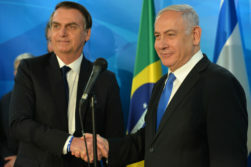 In prior comments, Netanyahu noted that Bolsonaro is making his first visit out of South America by coming to Israel, bringing with him the “largest Brazilian delegation” to ever visit the Jewish State. “You have come to Israel in order to bring relations between us to a new height,” said Netanyahu. In the past, Brazil-Israeli relations have not been what they could be, but Netanyahu believes Bolsonaro is changing that. That hope—hope for better relations, hope for a Brazilian embassy in Jerusalem—is the theme of the Brazilian visit to Israel so far. “I think that you represent great hope for a new start in Brazil. This is abundantly clear from your decision to be here and from your being under our roof, which is an amazing new start in Brazil-Israel relations,” said Netanyahu to Bolsonaro.